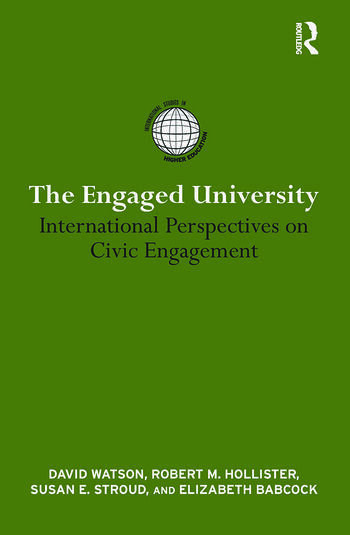 The Engaged University is a comprehensive empirical account of the global civic engagement movement in higher education. In universities around the world, something extraordinary is underway. Mobilizing their human and intellectual resources, institutions of higher education are directly tackling community problems – combating poverty, improving public health, and restoring environmental quality. This book documents and analyzes this exciting trend through studies of civic engagement and social responsibility at twenty institutions worldwide. This timely volume offers three special contributions to the literature on higher education policy and practice: a historical overview of the founding purposes of universities, which almost invariably included a context-specific element of social purpose, together with a survey of how these "founding" intentions have fared in different systems of higher education; a contemporary account of the policy and practice of universities – all over the world – seeking to re-engage with this social purpose; and an overview of generic issues which emerge for the "engaged university." David Watson is Principal of Green Templeton College, Oxford. Robert M. Hollister is Dean, and Pierre and Pamela Omidyar Professor of Citizenship and Public Service in the Jonathan M. Tisch College of Citizenship and Public Service at Tufts University. Susan E. Stroud is Executive Director, Innovations in Civic Participation. Elizabeth Babcock is Talloires Network Coordinator, Innovations in Civic Participation.